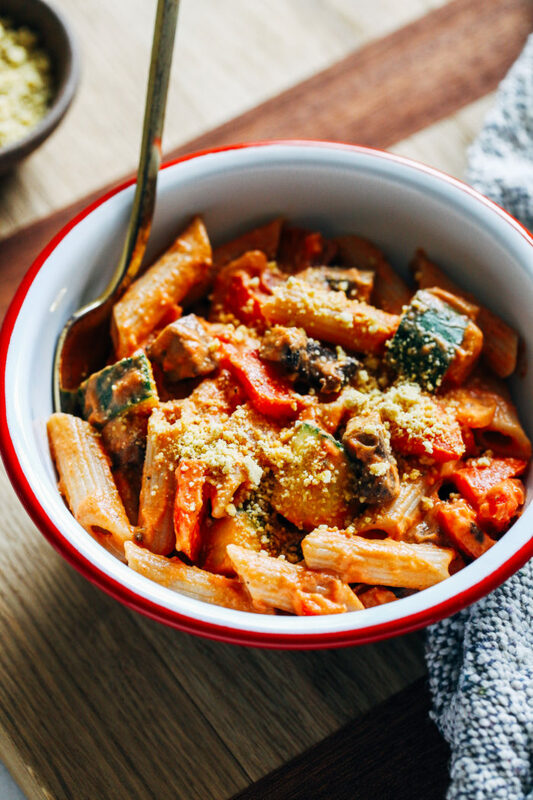 Roasted Vegetable Penne- tossed with a creamy marinara and tender roasted vegetables, this pasta is super satisfying and perfect to serve for the holidays! 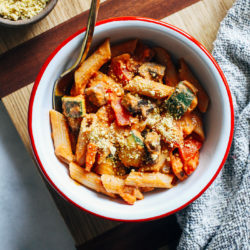 This comforting penne pasta is based off of a recipe I used to make all of the time when I first started cooking at home. It’s so simple that anyone can make it. 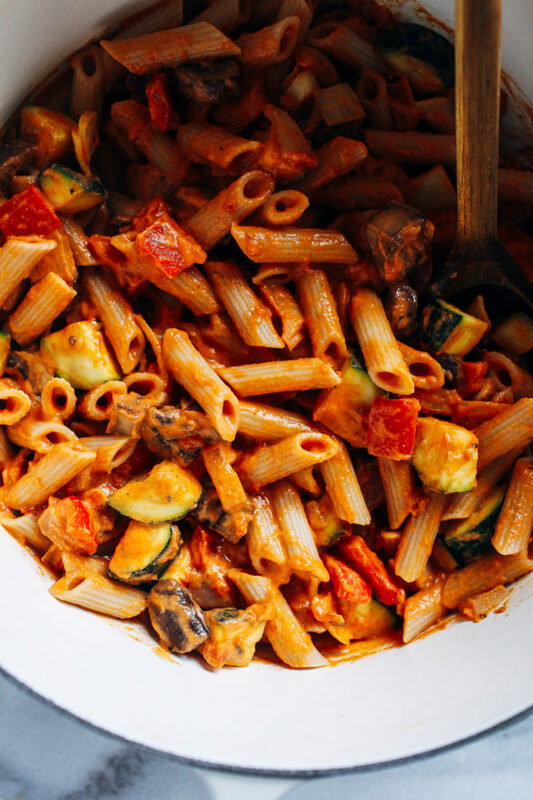 All you have to do is roast some vegetables, boil some pasta and toss it in marinara. Bada bing, bada boom. The main difference between my version and the original version is cheese. I mean, lots of CHEESE. It’s a Giada recipe so I guess that shouldn’t come as a surprise. Because we eat dairy-free in our house, I decided to nix the cheese and instead blend cashews with the marinara to make a creamy red sauce. Sprinkled with cashew parmesan, the result is just as satisfying as the original. The great thing about this recipe is that it can easily be scaled up to serve for family gatherings. All you have to do is double the pasta and the sauce, and transfer everything to a 9×13″ baking dish. Then you just reheat it in the oven when you’re ready to serve. Fair warning for my gluten-free friends: I have yet to find a gluten-free pasta that reheats well so I would not recommend doubling it if you’re using gluten-free pasta. In fact, I would only cook what you plan to eat then save the leftover sauce and veggies for fresh cooked pasta later on. There’s nothing worse than going to eat leftovers and the pasta is a bunch of mush. Been there, done that! Whether you’re looking for a simple weeknight meal or something easy to serve for the holidays, I hope this fits the bill. Enjoy! Preheat the oven to 450°F then line two baking sheets with parchment paper or a silicone mat. 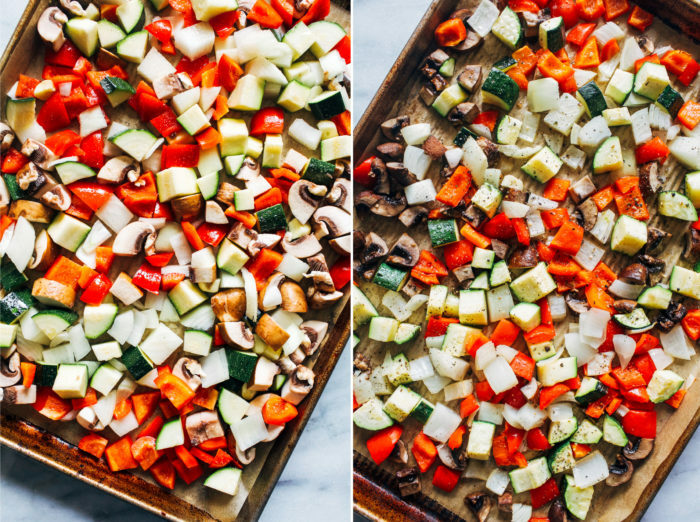 Arrange the diced vegetables on top, drizzle with oil and toss to combine. Spread the vegetables out so that there is some space between each piece. Bake in the oven for 20 minutes, or until tender. Set aside to cool. Meanwhile bring a pot of salted water to a boil. Cook the pasta as directed, or until al dente. Strain the pasta while reserving 1/4 cup of the pasta water. Add the pasta back to the pot and set aside. 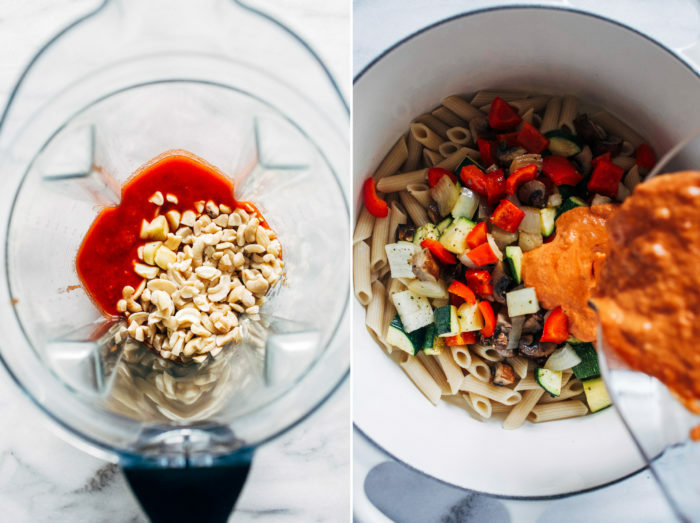 Strain and rinse the soaked cashews then add them to a blender with 1 cup of the marinara and 1/4 cup of pasta water. Pick out the garlic from the roasted vegetables and add it to the blender as well. Blend on high until smooth. Pour the mixture into the pot with the cooked penne along with the remaining marinara. Add the roasted vegetables and stir to combine. Sprinkle with cashew parmesan, serve warm and enjoy! Recipe can be doubled to serve for large gatherings! I recommend doubling every ingredient except the mushrooms then transfer the finished pasta to a 9×13″ baking dish and reheat in the oven before serving. *To soak cashews: bring a pot with 2 cups water to a boil. Remove from heat and set aside. Add cashews and allow to sit for at least 30 minutes. Drain and rinse then add to the recipe as directed. 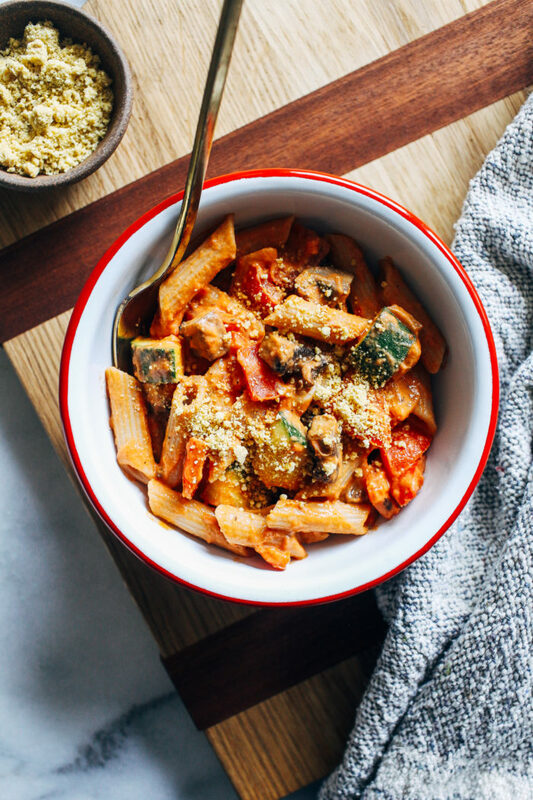 **To make your own vegan cashew parmesan, combine 1 cup raw cashews with 4 tablespoons nutritional yeast, 1 teaspoon fine sea salt and 1/2 teaspoon garlic powder in a food processor and pulse until finely ground.